July 4 is near! Are you ready to razzle dazzle in your boldest red, white, and blue? It’s your patriotic duty to don your stars, stripes, and most Americana ensembles on the Fourth of July. If these colors aren’t found in your closet already, not to worry! There are lots of patriotic pieces available right now for a budget price. 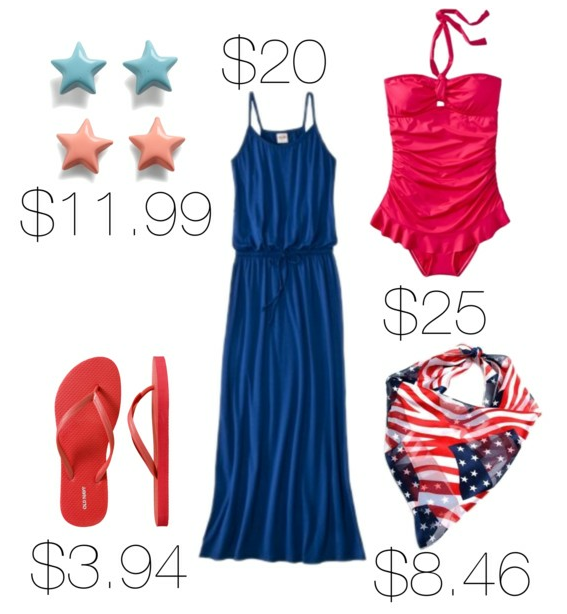 Read on for my tips on what to wear for the Fourth of July. I’ll show you five must-have pieces that are all less than $25! Keep casual — Whether you’re going to a barbecue or fireworks, there’s nothing stuffy about the Fourth of July. Keep your ensemble casual and practical for chasing kids, cooking, or sitting on a blanket on the ground. You can’t go wrong with a simple pair of red flip flops! Be sun safe – Make sure you and your family is lathered up in sunscreen if your day will be spent outside. Everyone — from mom and dad to the kids — should be equipped with a pair of sunglasses that block both UVA and UVB rays. Try to head inside for a couple hours during the heat of the day so that no one gets too hot. Be ready for water – Whether it’s running through the sprinkler in the backyard, enjoying the pool, or taking your turn on the water skis, make sure you’re ready in a suit that makes you feel great! I love this bright red one-piece from Target. Have some fun — Let loose and wear something that’s downright patriotic. These cute earrings from Modcloth come in a set of two — one for you and one for maybe your daughter. And you can’t go wrong with a star-spangled scarf! Are you ready for the Fourth of July? author bio: Sarah Heckle is a fashion writer from Indianapolis. Adorable and great buys!! I really like the bathing suit. Well done! These look really nice. I always struggle with dressing for the 4th of July. Maybe it’s just me, I wonder if wearing the flag is disrespectful in clothing. I am an overthinker. I should just go for it. Thanks for sharing these options! Good post! i have the swim suit, I need some sun dresses! Great tips, but don’t forget the hat!! Another great sun-protection tip. I LOVE maxi dresses. These are great budget-friendly choices. The bathing suit is really cute, too!